It's been roughly six months since the National Football League announced NFL Now, a digital network designed from the ground up to, hopefully, fit the needs of fans on the internet. Today, the video service is finally scheduled to launch, just in time for the ongoing preseason and, soon, the start of the regular season. At first glance, it's easy to see that NFL Now has a lot of great attributes, but some that quickly stand out are its worldwide availability and the fact it doesn't require any sort of authentication, pay-TV and the like, in exchange for content access. Better yet, it will be available in a vast number of platforms and services from day one, including iOS, Android, Windows Phone 8, Windows 8, Roku, Yahoo Screen, Yahoo Sports and on the NFL Now website. That's not all, however, since the NFL's new service is expected to come to Xbox One, Kindle Fire and Fire TV soon, with the Apple TV reportedly in the same boat as those devices. At the heart of it, NFL Now is all about personalization and giving its users a way to stream videos they're interested in, from teams and players they actually care about -- and no, this isn't a channel for watching live games. Naturally, it made sense for the NFL to integrate the product with its own Fantasy Football service, allowing you to see up-to-the-minute highlights and other valuable content related to your squad and the leagues you're a part of. But highlights aren't the only thing NFL Now is focused on delivering to you on game day and beyond; it offers news, analysis and live events, like press conferences, as well. The NFL also wanted to make sure the content wasn't just being pulled from its other properties (NFL Network, for example), so it built a studio in Los Angeles to create original programming specifically for NFL Now, which is in addition to the videos that each team will be producing on their own and putting up on the newly minted online network. Even though NFL Now is completely free for anyone to use, NFL does plan to offer a premium tier, one without ads showing up very four videos or so. For $2 per month, NFL Now Plus will give you everything we've mentioned plus access to the NFL Films vault: Hard Knocks, America's Game, A Football Life and more popular productions. In addition, the NFL says Plus subscribers can expect "the most robust in-game highlights experience" it's ever offered, alongside the ability to go into each game and watch stand-out plays shortly after they took place, whether it be on Sunday, Monday or Thursday games. Still, the league wants to make it clear that this doesn't mean NFL Now won't be solid as a free service, but it does want you to be aware of what the paid version has to offer. In hopes of luring you into NFL Now Plus, short clips from NFL Films shows are going to hit your free, ad-supported feed from time to time. That personalized stream of yours, by the way, has a SportsCenter-esque rundown menu, allowing you to easily see what video is due to show up next and skip it if you so choose. 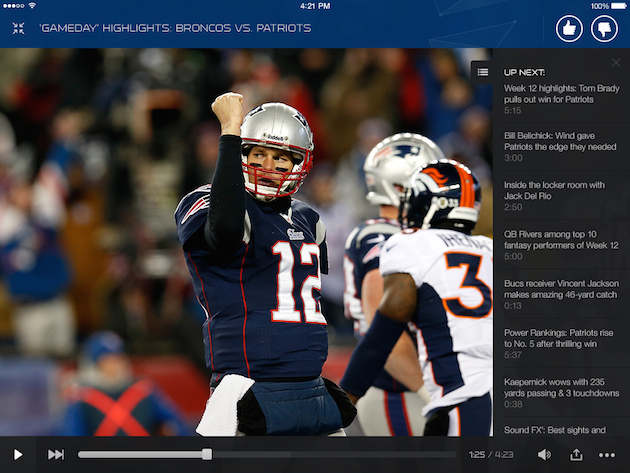 "We've never built a digital video platform like NFL Now." "We've never built a digital video platform like NFL Now," Chris Halpin, NFL VP of media strategy and business development, told Engadget. 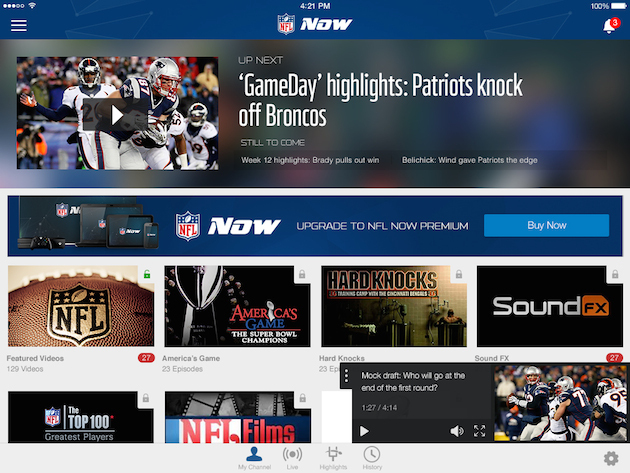 "With Now, the NFL wants to keep producing more content people want on their devices." That's why it was important to make the network available on as many platforms as possible from the very beginning. The idea isn't to stop there, though -- Halpin told us NFL Now will keep evolving and come to additional devices in the future, such as smart TVs and the aforementioned streaming boxes and game consoles. "Right now, we are focused on getting launched, but NFL Now is a long-term investment by our owners. The plan is to continue to grow it and invest in it, both in content and functionality," said Halpin. "Our goal is to build a robust platform that fits with our [entertainment] landscape. NFL Now is another way for us to connect football fans through internet-connected devices."